Where Is The Beckett Oil Burner Reset Button? 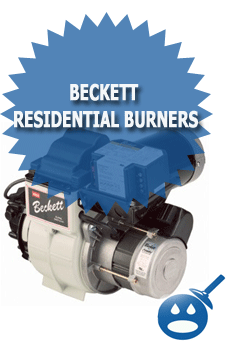 The Beckett oil burner has something called an Oil Burner Reset Button that will reset the burner if if has been locked out. The button on the Beckett model oil burner will be located towards the front of the burner. The button will be red and will push in to reset the burner. 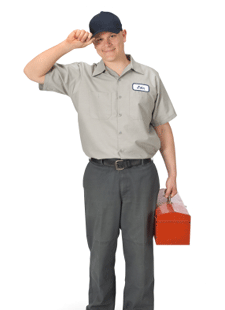 Most of the time when the oil burner reset button “locks out” the burner from starting, when there is some sort of problem with the unit. Think of it as a safety measure, in case there is a potential problem that might cause a significant damage to the unit. There is a cad cell which is located in the main control panel. That cell will function as a light sensor to detect if there is a continuous flame of light inside the burner. If it detected a discontinuation of the light, then it will make the red button trip thus shutting down the burner eventually. Some common things that will trip the reset button on the Beckett Oil burner are running out of fuel oil, a clogged burner nozzle, bad electrodes and many other things. If you notice a closed oil valve on the unit, it would be another cause of the tripped button. You can simply open the valve and retry from the beginning. Other cause might be an air trapped in the fuel line and the pump was not primed. In that case, you can try to prime the pump and recycle it, but be ready to call for the service if it gets too complicated. 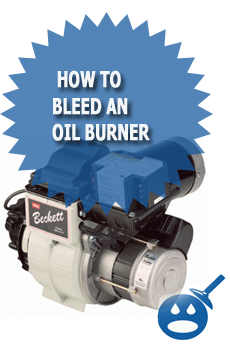 If you have ran out of oil and your burner reset button has tripped you will not want to reset the Beckett burner until you get more fuel oil. Once you get more fuel oil you can then push in the reset button and the burner should start. If you have pushed in the reset button once and the Beckett Burner does not start you should call a heating professional to come out and take a look at what’s wrong with your burner. There are over 100+ responses with questions and answers from many people. You can also hit the “reply” link to any comment and the system will send an update to the commentors and someone will most likely answer you. Just wanted to let you know, Your answer may also be in those comment replies as well. There is a link up top that says “recent comments” that will also tale you to other comment pages that may be able to help you as well. You can also check out this article as well and the comments there. I think the above should help you greatly. FOR ABOUT A MINUTE AND A HALF AND RELEASE IT .I DID IT AND IT WORKED . MY ?? IS WHY A MINUTE AND A HALF. They do that for safety reasons, so not just anyone , can just keep hitting the reset button, Usually when the oil burner trips the reset something is wrong and the burner will need professional repair, However, in some situations like when you run out of oil, the reset on the beckett burner could trip as well. Hope this helps and good to hear that your burner is running again! Thanks for adding to the feedback! It’s alright for acne marks, There are beettr things in my opinion though Specific herbs really heal the skin quicker and do a lot of good for your skin. Check out the how to get rid of acne scars video that I made the sangre de drago and graviola herbal liquid extracts are great internally as well as on the skin externally to heal the skin. Furnace wont turn on tried reset button. Fan works. thank you gentlemen for your answers it worked. i ran out of oil and tried to rest it screwed it uo first then it wouldn’t restart after a couple times of trying. so i did what you said held it for over a minute and it started. thanks again.. I ran out of heating oil. I got 5 gallons of diesel until i can get oil delivered. My father in law came over to help me restart. The becket oil burner wouldnt fire up to bleed and the reset was pressed more than 3 times and im on lock out. Is there anything i can do?